Want to turn your dumb car into a smart car? A startup called Zubie is now selling a wireless dongle that connects to almost any car’s onboard diagnostics port and sends location tracking, driving behavior, and maintenance and repair issues to a companion mobile app. 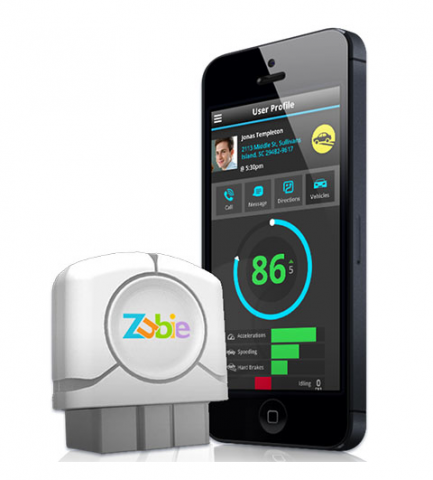 Zubie was incubated by Best Buy, and is now led by Tim Kelly, former head of the wireless division at Sprint. The company has just raised $8 million in Series A funding from OpenAir Equity Partners and an unnamed strategic investor. Zubie has multiple competitors, but it seems to be the furthest along of the pack, as its app, dongle and service are already on the market. Since 1996, every car sold in the U.S. has included a port that can help extract data about the vehicle’s speed, fuel level and error reports. This is called onboard diagnostics, and it has mostly been the domain of mechanics and certain car enthusiasts. That basically describes Zubie, too, except that its device is called the Zubie Key. Also, rather than sending data to a nearby phone via Bluetooth, Zubie is sold with an annual wireless connection, so it can be more of an independent device. A year of service on the T-Mobile network costs $99.95, and the device is included. Kelly said in a recent interview that he believes the cellular data connection is worth the expense and hassle, because it enables features like automatic check-ins while the car is turned off — so, if owners are traveling, and their cars are parked at the airport, they can be alerted if the battery runs down. The device connects to a Zubie app, which is iPhone-only for now. Users can analyze their data for personal use, share it with their family or employer, or eventually send it to insurance providers to try to get better rates. The benefits: Receiving predictions of coming breakdowns, low-battery alerts, translations of “check engine” and other alerts, and trade-in value estimates based on driving history. Also, the Zubie Key tracks 30 metrics of driving behavior. Kelly said the most important red flags are hard acceleration, hard breaking, speeding, nighttime driving and idling (a problem for fleets, especially). Zubie users get a dynamically calculated score — on a scale of 1 to 100 — of how well they are driving. And they can opt to share that score to see how they do versus family, friends, coworkers and the larger Zubie community. Zubie needs a critical mass of people to a) think it’s not creepy, and b) think it’s worth the money. The company depends entirely on someone wanting themselves to be tracked — or perhaps parents who want to track their teenagers. If you would like to be your own Big Brother, and get some discounts and offers from insurance providers in return for your radical openness, that’s your prerogative. Kelly said his company is “in late-stage negotiations with a major insurance carrier,” and already has deals with some corporate fleets. It’s also talking to wireless dealers to sell the Zubie Key as an accessory, and plans to distribute the device on its own site and BestBuy.com. If Zubie detects a problem with a user’s car, the app will send an alert and a cost estimate, and users will be able to make an in-app purchase to get a full report, or just take the error code to a mechanic to get it fixed. They can also set up geo-fences around places like home and work, so they send automatic alerts when Zubie users arrive and depart. If app users haven’t purchased the Zubie Key, they can still use the free app to track their family members’ phone locations, a la Glympse.